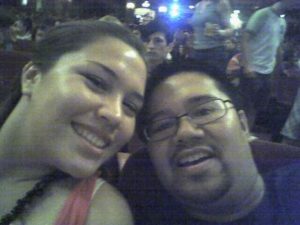 The most memorable time I saw Chris Carrabba / Dashboard Confessional was at the Chicago Theatre on July 28, 2006. That night was truly a spiritual experience for me. My cousin Christina attended the show with me that night. We sat in the third row. It was pretty amazing. Chris sang with such passion. The words, the performance, the setting — it all was just right. Whatever was happening in life back then, the show touched every part of the raw emotion I was feeling. I don’t know what emotional place Chris Carrabba was in that night. The music of Dashboard Confessional had always been so emo anyway. Was I just projecting my feelings into the music? Was the music just genius enough anyway that that was the reason it has touched so many people? Fast-forward to August 15, 2017. Dashboard Confessional is playing the Ravinia Festival in Highland Park, Ill. Just days before, I asked Christina, and her fiancé Dave, if they wanted to go. They immediately said yes. I was ready to re-live the emotion of 2006. I left the house after taking care of some projects. We met up at Dave’s after Christina got off work. We hopped in her car and traveled north to the venue. We didn’t rush to see the opening act. We were chatting in the car. We were keeping an eye out for a place to grab a bite to eat, and we stopped when we saw Portillo’s. We headed for the festival grounds and debated about where to park. We found a spot and could hear the opening act singing songs we knew. We didn’t have to lug our lawn chairs because I got a great deal on seats in the pavilion that cost just a few bucks more than the lawn. We picked up the tix at Will Call. We stopped at concessions for wine. We talked about other Ravinia shows as the first band wrapped up. Everything seemed normal. I had not a care on my mind. Christina & Dave were laughing with me about anything and everything. We got into the pavilion, which surprisingly was not as packed as the lawn area. People were in our seats, so we just sat a couple rows closer in an empty row. The normal annoyances of weird people in front of and behind us were present, but we ignored them and were having a good time. The lights dimmed and the band came out. Everyone cheered. The first song was “the song from Spider-Man,” as Dave described it, along with “the only song I know by them.” Ha! I realized, too — maybe I’m happier. Then it all came back to me when they sang “Don’t Wait.” A good reminder of the emotion of 2006. Chris Carrabba “doesn’t spell out the meanings of his songs” and “has always let listeners determine what his words mean for themselves, based on their own experiences” (MTV article). I’m trying to remember what I thought these lyrics meant in 2006. I’m trying to figure out what they mean to me in 2017. Regardless, it reminded me of where I’ve been, where I am, and where I’m going.